Dying of tuberculosis just before his 35th birthday in 1901, Vassily Kalinnikov had precious few years to prove himself as a composer, but still had the time to write several songs and choral and orchestral works, among which the two symphonies are the crowning glories. Especially the first symphony enjoyed a particular success even during the composer's lifetime, with performances in Berlin, Paris and Vienna, as well as in Moscow. It was famously recorded by Toscanini in 1943 and is still part of the repertory of many Russian orchestras. Kalinnikov’s gifts for melody, of a distinctly ‘Russian’ nature, and orchestration are frequently remarked upon, often in comparison to Tchaikovsky, who in fact supported his younger colleague. Another important figure in Russian music, Nikolai Rimsky-Korsakov, is said to have found evidence of real talent in a manuscript of the first symphony sent to him by the composer, but was apparently less than enthusiastic regarding its technical merits. 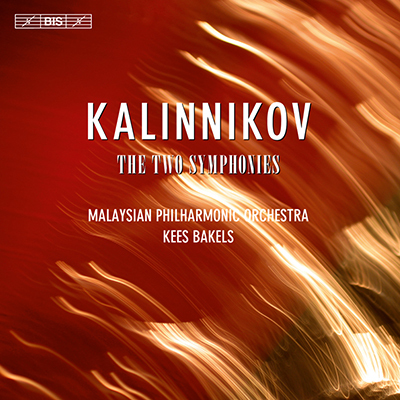 Rimsky-Korsakov’s own music was the subject of a four-disc survey by the Malaysian Philharmonic Orchestra and Kees Bakels, released as a boxed set in 2007 and given top marks by the website ClassicsToday.com: ‘The Malaysian Philharmonic under Kees Bakels plays with real enthusiasm and fire, and as always BIS's sonics represent that last word in brilliance… you have no excuse but to urgently snap up this set.’ On another website, classiqueinfo-disque.com, the reviewer found the result ‘dazzling: rarely has Rimsky-Korsakov’s music glowed with so much ardour, released its magic sparkle in such a luminous way and revealed its tender poetry…’ Here the team returns with two scores more or less contemporaneous with Rimsky’s Sheherazade or Capriccio Espagnole, but much less well known.